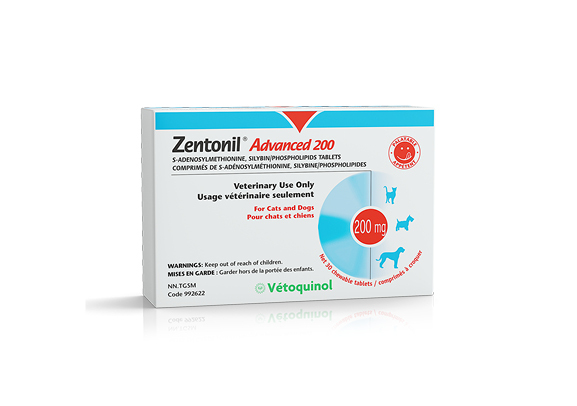 Depending on the nature and severity of your pet’s liver problem, your veterinarian may recommend administering SAMe alone (Zentonil® Plus) or a combination of SAMe + silybin (Zentonil® Advanced). 1. CENTER, S.A. « Antioxidants in liver disease » in Clinician’s Update: Focus on oxidative stress – overview, therapies and research. Supplément du NAVC Clinician’s Brief, sept. 2007. 2. CENTER, S.A., Compte-rendu du 18e congrès de l’ACVIM, Seattle (Washington), 2000 ; p. 550-552. 3. FRASCHINI, F., G. DEMARTINI et D. ESPOSTI. « Pharmacology of silymarin ». Clin Drug Invest, 2002 ; vol. 22, no 1, p. 51-65. How does the Vetoquinol Care Loyalty Program work? Vetoquinol Care Loyalty cards are available from your vet clinic. Show your card every time you buy one of the selected products. For 5 products purchased, you will get one free! Which products are eligible for the Vetoquinol Care Loyalty Program? The product list is available on the Vetoquinol Care Loyalty card. For more information, please go to your vet's office! For more information about this product, please contact your veterinarian.